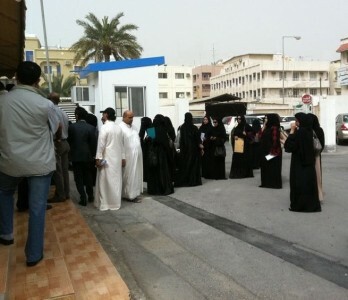 A week has passed since protests broke in the capital Manama on February 14th calling for real democracy in the Kingdom. Seven men have lost their lives, with the latest martyr Abdulredha Mohammed passing away on Monday in Salmaniya Hospital after being shot by military forces on Friday. 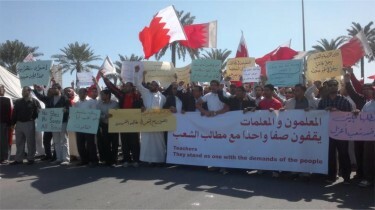 In support of the protesters at Pearl (Lulu) Roundabout, the Bahrain Teachers Society [ar] continued their strike from Sunday despite other labor unions in the kingdom lifted their plans of holding a nationwide strike. With the strike hitting hard on schools across the country, the Ministry of Education had no choice but to make an appeal for volunteer teachers to fill in for the striking teachers. The Minister of Education Dr. Majed Al-Noaimi appeared on national TV and announced that over 1074 people came forward to teach and run the schools. @bahrain_bahrain #Bahrain #unitebh: Even if a unity of faith is not possible, a unity of love is. The hashtag was lauded by Bahrain's Minister of Foreign Affairs Shaikh Khalid bin Ahmed Al-Khalifa – an enthusiastic Twitter user during a live interview on National TV. @abdullaameer Congrats @Redbelt, @khalidalkhalifa just mentioned the #UniteBH you started on BTV! @Redbelt So today as I typed #UniteBH I never thought it would catch on and end up mentioned on tv by our foreign minister @khalidalkhalifa! Thanks! I implore people to stop listening to the hogwash lies being spread, done so to scare people and ensure we are divided. Who would benefit from this divide, certainly not Bahrain’s citizens? Try looking at similarities not differences, you'll notice they far out weight the differences, make them your priority and concentrate on them when you meet your fellow Bahraini. We can all agree to disagree, but we do not have to stop being courteous, well mannered, pleasant; or to stop talking & fight one another. Let us instead understand the other point of view. A rally calling for National Unity was held at Al-Fateh Mosque with unprecedented numbers of attendees with national TV announcing that there was over 300,000 people. Many in the Bahrain Twittersphere reacted positively to Al-Mahmood's speech. On the other hand, the live video feed to Pearl (Lulu) Roundabout has been reinstated and can be viewed here.